This play was performed at the Nakamura-za in 7/1800. 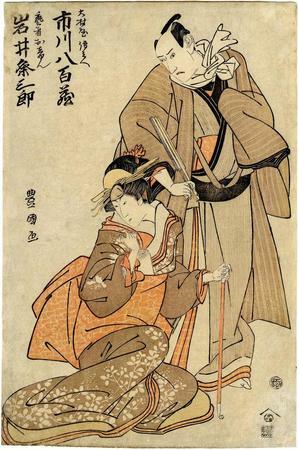 Synopsis: The Kyoto merchant Denbei loves the courtesan Oshun of the Gion quarter. One night, Denbei is forced to kill his rival in love, the evil samurai Kanzaemon, and then flee from the police. Oshun's family attempts to protect her from the scandal and the certainty that she and Denbei will take their own lives to atone for their illicit love, but they cannot overcome the lovers' devotion to one another. Denbei and Oshun finally escape along a road at night, and then commit double suicide.